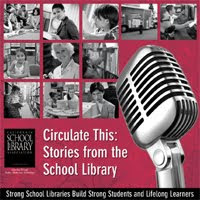 Listen to this: A just-released audio journal from the California School Library Association, "Circulate this: Stories from the School Library" is packed with powerful stories about school libraries. High School Teacher Librarian/CSLA Past President Connie Williams and songwriter/storyteller/public radio producer Joe McHugh collaborated on an audio journal project to capture stories from teachers, school administrators, children's authors, legislators, parents, and students about how school libraries and librarians make a difference in the lives of children. Connie orchestrated and arranged the project, Joe interviewed and captured the stories; both made magic happen when they put it all together. Listen to and share the stories! Says Connie: "We have created an audio magazine in which we tell the stories of the importance of school libraries and teacher librarians via interviews with teacher librarians, library staff, teachers, community members, parents, administrators, and most importantly, students. The format is along the lines of a 'This American Life' type of audio journal with a narrator, who sets the tone, describes the dilemma, and sets the stage for each interview. Each is short but dramatic and powerful. The intent is to distribute the audio journal widely on radio and across the Internet -- go 'viral' -- and to create CDs to hand to legislators and decision-making administrators. Teacher librarians and others are able to download the journal and burn CDs to distribute to their local administrators and parents". Joe McHugh, a talented Washington State storyteller and audio producer points out that "stories are effective because they deal in specifics, not generalities, and the best, in terms of persuasion, are told by those who have first-hand knowledge of what they are talking about.'" Many came forward to tell their stories. Among those presented here are stories from: Dr. Doug Achterman, Glen Warren, David Burt, Winny Duffy, Heather Keaton, April Wayland, Manuel Perez, Dr. Lesley Farmer, Donald Gill, Jeanne Nelson, Anne Birchfield, Hannah Jackson, Kathy Green, and Sophie. This project was sponsored by the generous donations of long-time school library advocates DEMCO, Follett Software, and Gale Cengage. Thank you for your support! NOTE from Connie: "California schools are in deep trouble, with the state budget in tatters and education taking the brunt of the cuts. This impacts school libraries all over the state. The California School Library Association has been exploring a variety of venues and strategies to bring school libraries out of these depths and into the limelight so that the services provided by strong school libraries can be in the forefront of any school reform." The good news is that the State Board of Education has requested Model School Library Standards.